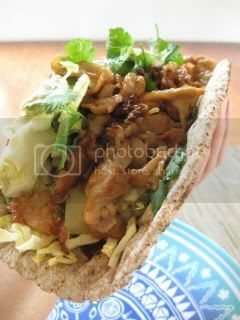 This time, I made a pita wrap with kurobuta pork. 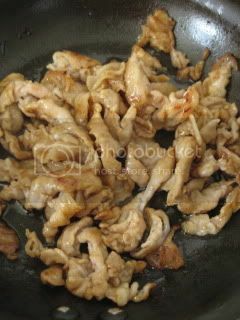 Thinly-sliced kurobuta pork loin (about 3 oz) was cut into bite-size pieces and marinated in 1 teaspoon of each sake, agave nectar, and donabe-smoked soy sauce for 10 minutes. It was then tossed in 1 teaspoon of potato starch ("katakuriko"), and sauteed with 1 teaspoon of sesame oil in a pan. When the meat is cooked through, I turned off the heat and finished with a small drizzle of more donabe-smoked soy sauce. The rest is the same as last fish pita wrap lunch. 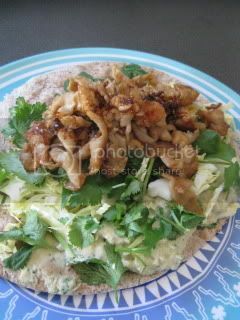 Whole wheat pita was quickly heated (both sides) on a pan, then topped with shredded cabbage, cilantro, homemade hummus, gruyere cheese. The meat was added at the end and some chunky la-yu and lemon juice was drizzled. I could barely wrap it and hold with one hand this time! Wow...the flavor was so decadent. The juicy smokey pork flavor was just incredible.